Note: This is an ærodynamic analysis that does not include effects that are equipment and rider dependent. Overcoming wind resistance (ærodynamic drag) presents the main effort for bicyclists, although climbing hills is more daunting. Unlike wind resistance, climbing effort does not diminish at lower speeds, which is partly why bicycles are used mostly in the flatlands. The effort of pushing one's way through the atmosphere is so limiting that most bicyclists ride in a fairly narrow speed range below 20mph. Regardless of whether racing, touring or shopping, ærodynamic analysis reveals some unexpected effects. Common knowledge has bicyclists always riding into the wind, regardless of direction, a perception that is not as wrong as it may seem. On level ground, one rides as fast as is comfortable and because the bicycle is highly efficient, speed is limited by wind resistance. With a tailwind, speeding up until the wind is in one's face is fairly easy, and at that point it becomes a headwind. With strong tailwinds, speeds are attainable at which wind drag in wheels (parts of which move at twice the speed of the bicycle) together with rolling resistance, can prevent going faster than the wind. This is similar to the limit on a stationary bicycle without a power dissipater. However, riding in such strong tailwinds is uncommon. Crosswinds, unlike tailwinds, can only be made into partial headwinds because forward speed cannot diminish the crossing speed of the wind, besides which controlling the bicycle also becomes a hindrance. 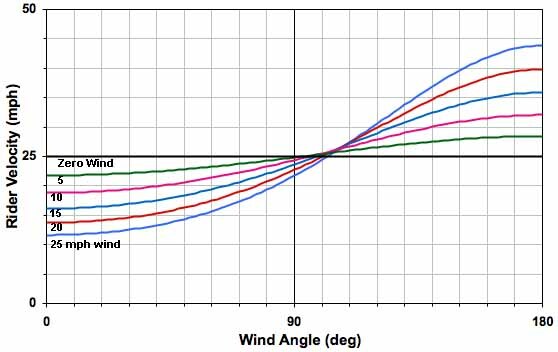 Wind drag is a nonlinear function of the relative wind. That is, drag does not increase in proportion (linearly) to wind but rather with the square of its speed relative to the rider. Relative wind-speed is the sum of wind and rider speed, which in still air is equal to rider speed. 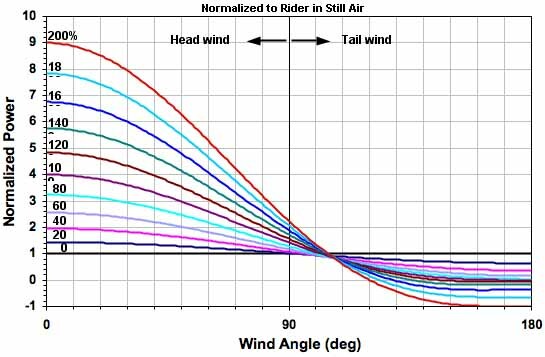 Direct head- and tailwinds can be combined by addition with rider speed to give relative wind-speed. Although inline winds add to or subtract directly from drag, they do not similarly affect the power required to overcome that drag. For instance, standing still in a 15mph wind requires no power because power is the product of inline drag and rider speed. Drag is proportional to the square of relative wind-speed while power is the product of the inline portion of that drag and rider speed. Thus, required power (in still air) increases as the cube of rider speed. Computing power from wind and rider speed, even for other than in-line winds, requires only addition, multiplication and a bit of trigonometry, but working back from a given power to rider speed is more complex. This requires solving for coefficients of cubic equations. Computer techniques can readily solve for and graphically display these results. The model for this analysis defines the bicycle and rider as a bluff body, a shape that has the same effective cross section from any horizontal aspect. Side loads on tires are assumed to produce no scrubbing from side slip, and wind is treated as being uniform from ground level up. These approximations appear reasonable, from correlation with wind tunnel data collected by Douglas Milliken (Bike Tech, August 1987) in Figure 1 . W (apparent wind-speed) is computed from the square root of the sum of the squares of U (rider speed) and V (wind-speed). D (total drag) is W squared, acting at angle B (angle of W). P (power) is the inline part of D, multiplied by U. 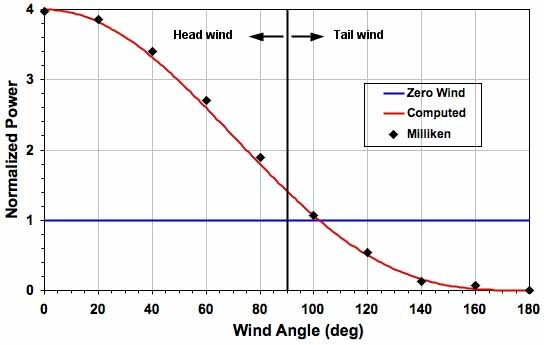 Figure 1 shows correlation between the equation and Milliken's data for a 15mph cyclist and 15mph wind with no streamlining. The wind-tunnel data was expressed in units of drag related to the rider's size and units of measure. Data was normalized to make it dimensionless and, therefore, comparable with computed values. Power and speed graphs are presented in normalized form, meaning the results are applicable to any rider at any chosen speed. Thus, wind speeds are expressed as a percentage of rider speed. 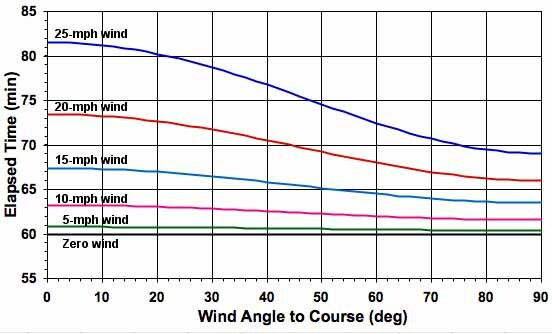 For example, at a rider speed of 20mph, the 80% wind curve represents a 16mph wind and shows what additional power must be expended at 20mph with a 16mph wind blowing from various directions. Figure 2 shows the power required to travel at constant speed, regardless of wind-speed or direction (as is common in driving a car). Figure 3 shows attainable speed at constant power with winds from various directions. Figure 4 shows elapsed time for a 25-mile time trial with steady winds from various directions for a rider who takes one hour in still air. The graphs show how both headwinds and crosswinds affect performance, and that, in an out-and-back time trial, a tailwind does not makes up for time lost riding into a headwind of the same speed. The effect of crosswinds is probably the most interesting because it has been the subject of much controversial conjecture. Although analytical, these curves accurately show the effect on bicyclists. A similar article, titled "Riding in the Wind", had appeared in a 1992 issue of Bicycle Guide magazine,attributed to Jobst Brandt but containing substantial material directly copied without reference from my article in the June 1984 issue of Bike Tech. This 2004 article was a copy of Brandt's earlier article that had been published in Bike Tech in 1988.